Description of "One Minute to Success (eBook)"
Most people do not know what they desire in life. They hardly have goals or any determination to make one for all that matters. They go through life living with the flow, expecting and waiting for the perfect moment that might not even happen. It is for this reason that their motivation will slowly die out as time progresses. Nevertheless, motivation can always be regained with a little personal push. It doesn’t matter if you don’t have a generally idea of what you want in life. By being goal-oriented, you will be able to slowly find your desires in life as you experience personal growth. Since life is filled with many opportunities to succeed, it can become difficult to decide what fits you the most. That is why this book will help you gain the motivation that you need for the outside world. Not only will it help you figure out where to find your motivation, but it will also teach you how to stay motivated and reach for success. Being a big supporter in personal achievement, Kerry Dale believes that individuals should have the opportunity to accomplish what they desire most in life. With a Master’s Degree in Communications, Kerry has spent the past three years as a motivation speaker for small business owners, or incoming entrepreneurs. After having many successful speaking sessions with different people, the author now acts as a personal coach to those who desire a push into reaching their goals, helping them achieve the same success that she has. 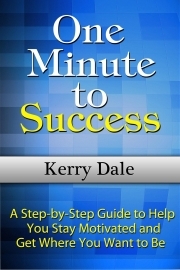 Reviews of "One Minute to Success (eBook)"